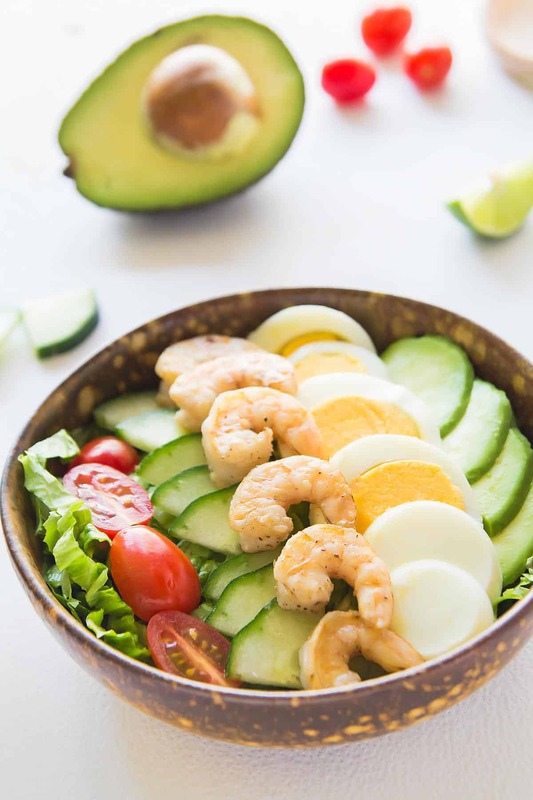 This fresh and vibrant Shrimp Louie Salad consists of a bed of lettuce topped with avocado, hard boiled egg, tomato, cucumber, and seared shrimp. Topped with the signature Shrimp Louie dressing this salad makes a delicious lunch meal. All tossed up, it could also be a great summer BBQ side dish. Until very recently I had never heard of Shrimp Louie and until further research I didn’t even realize that the name referred to a salad recipe. Shrimp Louie was super popular at the beginning of the last century (1930’s-50’s) – a little before my time, so no wonder I had never heard of it. It’s a classic seafood salad whose origins get assigned to either San Francisco or Seattle. Other versions include Crab Louie or Crab and Shrimp Louie Salad. While looking up Shrimp Louie salad recipes, I found a few ingredients that they all had in common. So I would consider them Louie classics. 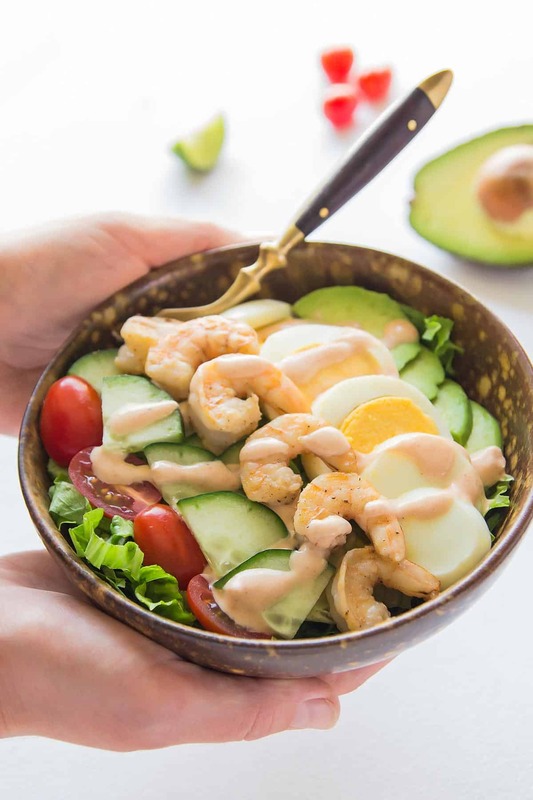 There always is a bed of greens (usually lettuce) with avocado, hard boiled egg (find the perfect egg recipe here), tomato, and shrimp as topping, and finally, a signature Shrimp Louie dressing to drizzle on top. Other toppings included cucumber, olives, or canned asparagus. I am not a fan of the latter two, that’s why I didn’t include them when coming up with my own best Shrimp Louie salad recipe. Apparently, there also is a Shrimp Louie sandwich which uses the same ingredients and layers them inside of a bun or between two sliced of bread. I have to say, that sounds like an amazing lunch idea to me. In my research I found that every Shrimp Louie dressing recipe called for mayonnaise and chili sauce of some sort – which makes it similar to Thousand Island dressing. In an attempt to make this Shrimp Louie recipe healthier and clean eating, I experimented with Greek yogurt as a replacement for the mayo. I’ve had great success with this substitution in other salad dressings but whichever way I tried it, I didn’t like the results in this case. So I reverted back to mayonnaise, but made it myself with healthy avocado oil (not the GMO soybean oil you’ll find in most commercial mayonnaise). So it still is clean eating. If you don’t want to make homemade mayo, Chosen Foods also makes avocado oil mayonnaise. I have even seen at Costco (at least in Canada) or otherwise there is always Amazon. Now, some of the Shrimp Louie salad dressing recipes I found specified the chili sauce to use while others left it wide open. The ones that were specific usually used Heinz chili sauce, which really is more like ketchup than anything else. I wanted my Shrimp Louie sauce to actually have some chili kick to it, so I experimented with different chili sauces. First, I used a fiery hot Habanero sauce and only used 1 tablespoon of it. The next time I used a smoky Chipotle chili sauce, that was a lot milder and almost sweet in taste. So I upped the amount to 3 tablespoons. For this reason, I am giving a range instead of a specific amount for the chili sauce in the recipe for Shrimp Louie below. Depending on your heat tolerance and how hot your sauce is, you may have to adjust. I wrote out the recipe to serve 4 people. 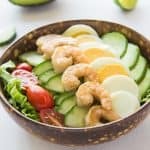 I prefer to showcase the awesome ingredients of this salad by arranging individual salad bowls with rows of avocado, egg, tomato, and shrimp on top. However, you could also turn this into a salad for a crowd to serve say at a summer BBQ. In that case tossing everything up in a large bowl works as well, it will just look a little less pretty. Start by preparing the Shrimp Louie salad dressing. Stir together mayonnaise, chilli sauce (adjust amount to desired heat level), Dijon mustard, lime juice, salt, and pepper. Add a little water, if needed to make the dressing pourable. Set aside. Heat a skillet to medium-high heat, then add the butter to melt it. Prepare the shrimp by seasoning them with salt and pepper from both sides. Place them in the hot skillet and sear for 2-3 minutes from each side until pink and curled into a C. Remove seared shrimp from pan and set aside. Assemble the Shrimp Louie salad. You can toss all ingredients in a large bowl, but I prefer assembling individual salad bowls. 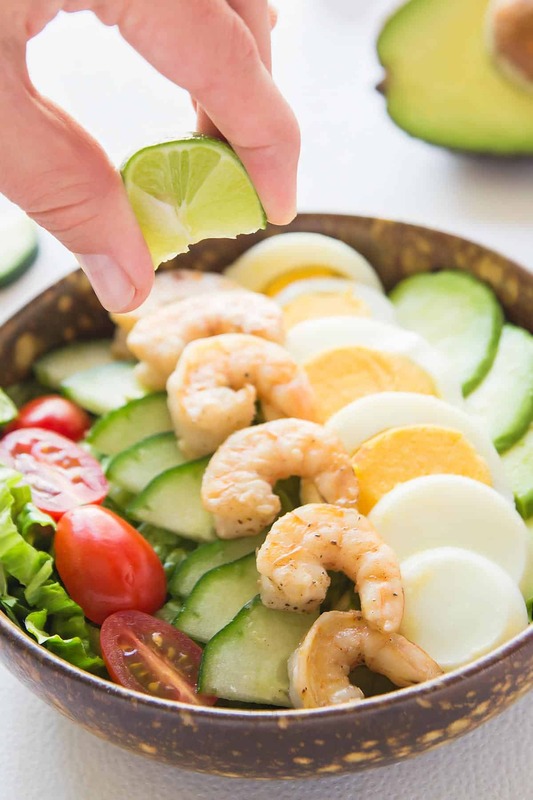 Place the shredded lettuce into the bowls first, then arrange sliced egg, cucumber, avocado, cherry tomatoes and shrimp on rows on top. 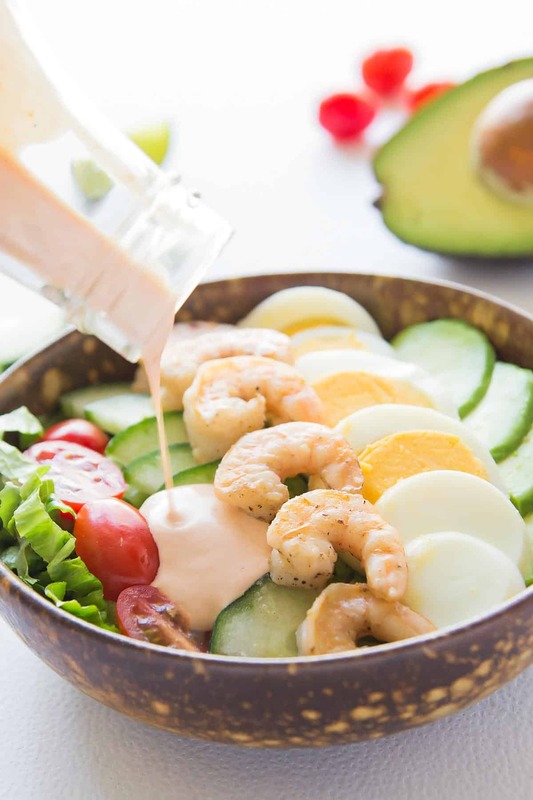 Add a lime wedge to each bowl and drizzle with the prepared Shrimp Louie sauce. * Adjust amount of chili sauce to the heat level you can handle. Sometimes I use a Chipotle chili sauce which gives the dressing a great smokiness, but it is not too spicy so I use 3 tablespoons. Other times I have used a Habanero chili sauce that is quite hot, so I used only 1 tablespoon of it. I’m of the age to remember Shrimp and crab Louie salads on restaurant menus throughout the western states. Certainly, shrimp is delicious, but a salad with Dungeness crab is to die for! In my opinion, it’s the only crab worth eating. (I hear you east and southern coasters, BUT it’s an opinion – and true!. I’m fixing this shrimp version for tonight’s dinner and I’m sure it will be splendid! Can’t wait to make it, with some homegrown cherry tomatoes and cucumbers. Yum yum. I never heard of Shrimp Louie before, but I LOVE all these ingredients together, especially shrimp + avocado! I know I would love this! This salad has EVERYTHING that I love. YUM YUM YUM! Want now!